Condensation gets a lot of attention during the winter months and can be a real hot button with window companies. Sometimes it is directly related to the window but the majority of cases stems from the humidity of the structure the windows are installed in. The average R-value on the glass of a window is R-3, the R value in your wall can range between R-11 and up depending on your insulation. The insulating ability of your wall is 4-10 times more efficient than your window. Condensation will reveal itself in well insulated homes when moisture laden air attaches to cold interior window glass. 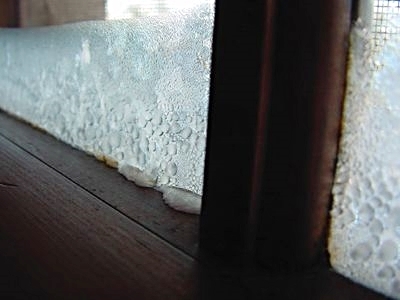 Condensation will not reveal itself in poorly insulated or drafty homes, the moisture laden escapes through drafts. How do I stop it? During a Minnesota winter condensation can only be managed, every day activities produce moisture regardless. My experiment: I have a 36x30 heated & insulated garage with 3 different brands of windows installed in it: Marvin, Integrity, and Andersen. During the winter snow on our vehicles would melt and the moisture was literally stuck inside the structure. It felt like a jungle inside, and all the windows condensated to the point of ice up. The structure was too tight, I tried a large floor fan, I ran the ceiling fan nonstop, nothing helped. Mold started populating in the corners and even on the garage doors. It was a losing battle with moisture. During the summer I installed an exhaust fan and this winter I have witnessed a dramatic decrease in moisture. The droplets are barely visible. The fan is designed to run 24/7 and it does during cold or snowy periods. The results are this: You can have the best window brand, however if the moisture is not managed problems are going to arise. This page is meant to give homeowners and contractors insight on situations we commonly see at Freeborn Lumber. Freeborn Lumber is a design center located in Albert Lea, MN. We specialize in home design, remodels, and additions. We offer drafting, estimating, and delivery services. We don't stop at just drawing your dream, we have a 2000 square foot showroom for ideas and a full lumber yard to supply it too. From design to delivery we have you covered at Freeborn Lumber.